Capt. 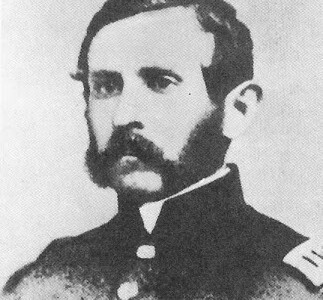 William J. Fetterman overestimated his abilities and severely underestimated his opponent when he told his commanding officer “Give me eighty men and I’ll ride through the whole Sioux Nation.” Later that day, an hour after leaving Fort Phil Kearney in Wyoming Territory, Fetterman disobeyed his commander’s order and crossed the two-mile point beyond which his patrol couldn’t be seen from the fort. Taunted by a small band of Oglala Sioux led by Crazy Horse, Fetterman and his eighty men pursued the “hostiles” … and ran smack into 2,300 Lakota, Arapaho, and Northern Cheyenne. In less than 20 minutes, Fetterman and the men under his command died. Most were scalped, beheaded, dismembered, disemboweled and/or emasculated. Among the Sioux and Cheyenne, the event is known as the Battle of the Hundred Slain or the Battle of 100 in the Hands. Whites know it better as the Fetterman Massacre. A fort constructed nearly 200 miles to the south was given Fetterman’s name seven months after his death.